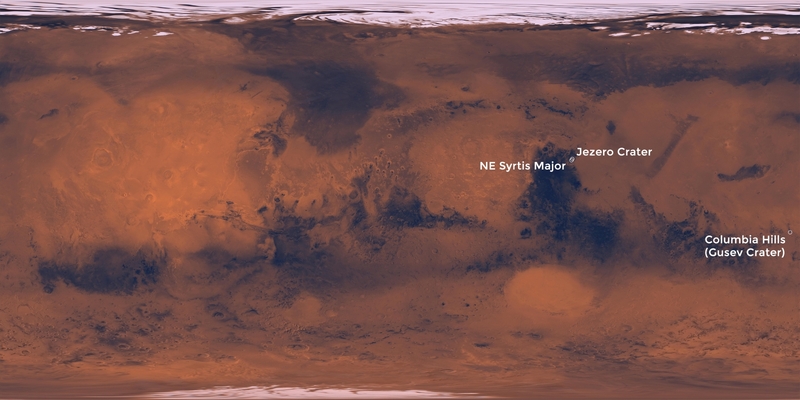 The number of potential landing sites for the Mars 2020 rover has been narrowed down to three, from a list of eight, following a conference of scientists last week. The top three landing sites that were selected were in Northeast Syrtis Major, Jezero Crater, and the Columbia Hills in Gusev Crater. The landing sites in the Columbia Hills and Syrtis Major display evidence of geothermal and mineral hot springs that could have been conducive to hosting primitive life, and Jerezo Crater shows evidence that it was once a lake of liquid water. Northeast Syrtis Major was once influenced by volcanic activity that warmed underground sources of water ice that reached the surface as mineral hot springs. These hot springs could have hosted microbial life similar to organisms that have been found in similar environments on Earth. The area also displays layered terrain that holds a record of the interactions between water and minerals throughout early Martian history. 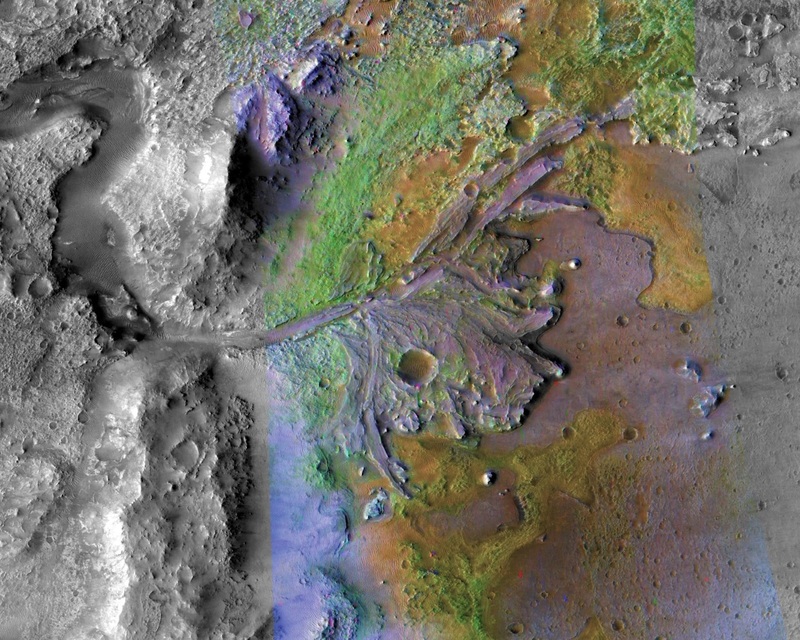 Jezero Crater is an example of the on-again/off-again nature of liquid water on Mars. There is evidence that the crater was filled and drained of water on at least two different occasions around 3.5 billion years ago. Channels can be seen leading into and out of the crater, and there is spectral evidence that suggests clay minerals were formed and deposited as sediment in the lake. These clay minerals are similar to the sediments being examined by the Curiosity rover in Gale Crater and could have played host to microbial life. The Columbia Hills were famously explored by the Mars Exploration Rover (MER) Spirit between 2003–2010 where it discovered evidence the area once hosted a hot spring with liquid water similar in composition to hot springs found on Earth. If selected as the final landing site, the Mars 2020 rover would further inspect hot spring sediments to investigate their potential to host life. Mars 2020 will also revisit an outcrop that was visited by Spirit which in a recent analysis by scientists was thought to resemble a fossilized mat of microbial organisms that have been found in similar hot spring sediments on Earth. This particular outcrop represents the strongest evidence for fossilized life to have been found on the Martian surface to date. 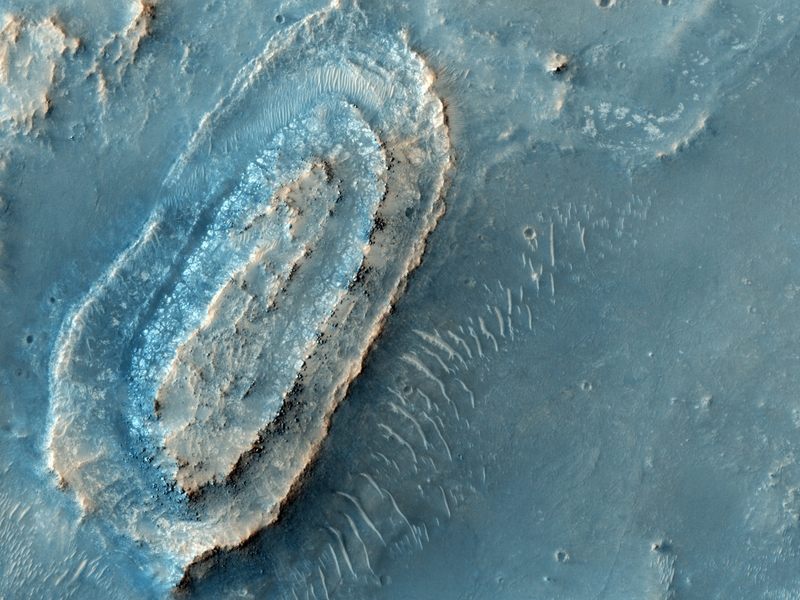 Characterize the past habitability of Mars. Collect and cache samples for possible retrieval by a future spacecraft and return the samples to Earth for further examination. Prepare for a human mission by demonstrating the use of in-situ resource utilization (ISRU) technologies to create propellant and consumable oxygen; to characterize atmospheric dust to understand its effects on human health, and to collect surface weather measurements to validate global climate models. Does the area show signs in the rock record that it once had the right environmental conditions to support past microbial life? Does the area have a variety of rocks and “soils” (or regolith), including those from an ancient time when Mars could have supported life? Did different geologic and environmental processes, including interactions with water, alter these rocks through time? Are the rock types at the site able to preserve physical, chemical, mineral, or molecular signs of life? Is the potential high for scientists to make fundamental discoveries with the samples cached by the rover, if potentially returned to Earth someday? Does the landing site have water resources (water ice and/or water-bearing minerals) that the rover could study to understand their potential use by future human explorers? Can the rover land and travel from place to place without facing significant hazards posed by the terrain? The three finalist landing sites were selected from an original list of 8 which also included Eberswalde Crater, Holden Crater, Mawrth Vallis, Nili Fossae, and Southwest Melas Chasma. The rover is currently under development and is similar in construction and function to Curiosity and is targeted to launch during the summer of 2020 and landing on Mars in early 2021.